12 white roses arranged in a darling bouquet. 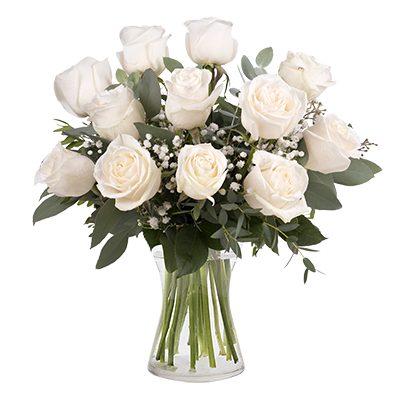 Send a dozen white roses with FloraQueen’s international flower delivery to over 100 countries around the globe. A white flower is enough to make anyone's day, and fresh flowers in a bouquet are an excellent choice. Often used in exotic flower arrangements, white flowers are known for their presence at the most emotional events in our lives, be it a wedding, funeral or just a special birthday. 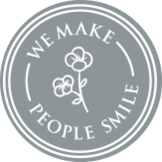 That's why these pure and innocent flowers are so meaningful to us and therefore you can be guaranteed a delivery of high-quality flowers that have been put together with the utmost care. Pick the perfect bouquet that will share the most smiles- Will you choose exotic white roses or another of our selections. Tell us where you want to deliver to - We can deliver to over 100 countries! Our international service allows you to deliver white flowers worldwide for that special occasion, whatever it may be, and ensure that your presence is felt, even if only in spiritual form. We know that on important and sensitive events, only the best is acceptable, so we make sure that the white flowers retain their brilliance through our international flower delivery service. You know that you can rely on FloraQueen to deliver flowers of only the highest standard, straight to their door from anywhere in the world.